Our Hercules LTE wireless modems are built by us - with care - in North America. Our casings are made of metal. They’re not just some off-the-shelf piece of plastic, made in who knows where, with some re-sellers logo slapped on it. They’re like you - rugged and ready for anything. Our network architecture routs all transactions through our data centres, giving us, and you, complete visibility of what’s happening at your ATMs, with your cellular carriers, and with your payment processors. All through the mobile friendly Hercules Portal. When we say 24/7/365 technical support we mean it. With a 99% response rate, we’re here when you need us. Our Hercules modems can auto detect the terminal IDs meaning no more manually recording and tracking which Hercules modems are installed in each ATM – making it even easier to remotely monitor and manage your fleet of ATMs from anywhere. See real-time status updates regarding connectivity health of your ATMs, Hercules modems, DPL Data centres, and Processors. Similar to the Fleet Health Dashboard the Terminal Health Dashboard provides real-time status reports about the health of individual terminals. Receive alerts about issues affecting the health of your terminals by email, SMS (text message), or view them in the Hercules Portal, assisting with diagnostics and minimizing downtime. Filter by alarm type and health status to see only the information you need to see in order to help you quickly troubleshoot issues affecting your ATMs. Avoid lost transactions, travel, and tech fees with the ATM Restart. Remotely reboot your ATMs anywhere, any time from the mobile friendly Hercules Portal. Add a layer of physical security to your assets. The Protector GPS sends multi recipient text, phone call, and email alerts while thefts are in progress and gives you the ability to share a secure link from the mobile friendly Hercules Portal with local law enforcement - enabling them to track your ATMs GPS position in real time. 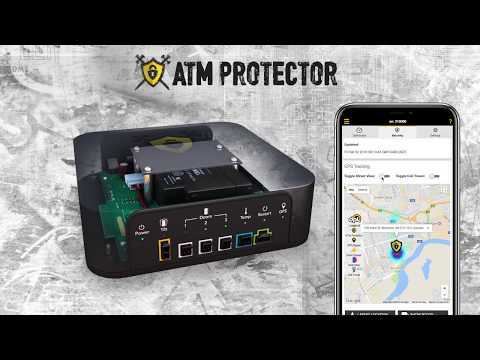 Protect your ATMs from physical and logical attacks using the Protector GPS’ layered security features.